Everyone knows you’re not supposed to read someone else’s secret diary but you’re welcome to read mine. I won’t tell you my name. I won’t tell you what I look like. I won’t tell you where I live. I will tell you all my secrets. I will tell you why I kill. I will tell you how I kill. Tara’s debut crime novella gives a unique perspective on murder. That of the killer. The victims, the people left behind and even law enforcement don’t have a voice in this diary, because they don’t have a voice in his world. 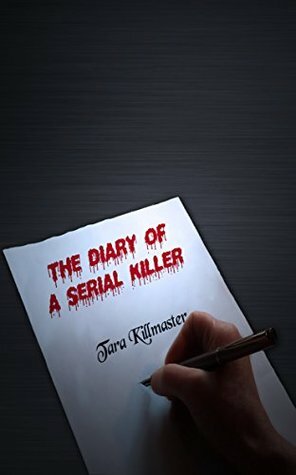 If you want to know what a killer thinks about and feels during planning and carrying out a murder and even afterwards, look no further than ‘The Diary Of A Serial Killer’. I don’t normally read novellas as I feel that I am just getting into them when they end but a couple of fellow bloggers had read and reviewed this and I must admit that I was intrigued. Firstly if you are the slightest bit squeamish do not buy this book you won’t just have nightmares but day jitters too because boy this is pure gruesome. It is really strange because this is a private diary, one which the author, the serial killer, makes perfectly clear he doesn’t want finding. It feels like you are the diary page rather than a person. The page that is witness to his inner thoughts and wicked deeds. A silent accomplice powerless to have an opinion but one he needs to tell his deeds of greatness to as he can’t tell a living soul of his work. Yes work, nothing is random nothing to chance and every detail logged. This is a brilliantly written novella, 62 pages of grim fascination which I read quite a lot with a dropped jaw. The casual attitude made this all the more disturbing. This is truly a most compelling book. My passion for writing began at an early age and I have been writing (and deleting!) short stories and the beginnings of novels for many years now. So far, I’ve only published one novella but I’m currently working on something I hope to be published in the near future.